Periodic limb movement disorder (PLMD), also known as nocturnal myoclonus, is a condition where a sleeper moves limbs involuntarily during sleep, thus disrupting normal sleep patterns. Limb movements usually occur at periodic intervals from 20-40 seconds apart, mainly during the first half of the night, and only during non-REM sleep (during REM sleep, any movement is overridden by the muscle atonia or paralysis that accompanies that stage of sleep). These movements are associated with partial arousals or micro-awakenings, although the sufferer is usually unaware of the limb movements or even of the frequent sleep disruptions. 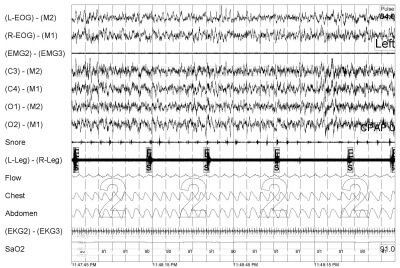 The involuntary kicking during sleep that most often characterizes PLMD causes sleep disruption for both the sleeper and, perhaps to an even greater extent, their sleeping partner. Unlike restless legs syndrome (RLS), where the sufferer voluntarily moves limbs to dispel an uncomfortable feeling, and which tends to occur mainly during resting waking hours, PLMD movement actually occurs during sleep itself and is completely involuntary, with the sufferer usually not even being aware of the movement. However, the two conditions are linked to some extent, and 80% of RLS sufferers also report PLMD (although the reverse association is much weaker). Both PLMD and RLS are much more common in older people, affecting up to a third of all over-60s by some estimates, and the two disorders are often talked about together and conflated, although they are quite separate complaints. There are also some possible associations with REM sleep behaviour disorder and narcolepsy. PLMD movements occur as a result of a sudden contraction of one or more muscle groups, but the root causes remain unknown. Many Parkinson’s Disease patients also suffer from PLMD, so it is hypothesized that a lack of dopamine may be involved. Other contributing factors include shift work, coffee, stress and exercise just before bedtime. Treatment of PLMD typically includes the elimination of these contributing factors as far as possible, and pharmacological treatment with the same drugs as are used with Parkinson’s Disease (e.g. L-dopa, dopamine agonists).